One future application of this system is the dermal application of substances for drug testing in vitro. In this study a method to simulate and validate the permeation of fluorescein sodium salt through a barrier in the MOC was established. Fluorescein sodium salt has a molecular weight of 376.28 g/mol which is in the range of steroid hormones like testosterone (288.4 g/mol), aldesterone (360.4 g/mol), hydrocortisone (362.5.4 g/mol) and corticosterone (346 g/mol) . Furthermore, first permeation experiments through four cell-collagen models, as reference for skin models, were carried out. To test the feasibility of the permeation experiment with skin models, four different setups with a HaCaT cell line and primary fibroblasts (HaCaT+fibro, fibro, HaCaT and only collagen) were established. Therefore, the cells were immobilized in collagen gel. The experiment was also performed in a 12 transwell system using fluorescein sodium salt. The standard deviation of the experiment with the MOC is high with approximately 25 %. Possible reason could be attributed to the experiment a setting by slight variation of the gel and positioning of the transwell in the MOC. Fig. 1 b) shows the results of the simulation validation with fluorescein sodium salt. There is a accordance indicated by the mean permeation coefficient of the experiments and the simulation with a standard deviation of 3.05 %. The results of the experiment with cell-collagen setups is shown on Fig.1 c). The permeation coefficients are 1.31 ± 0.26 x10-7 m/s for only collagen, 1.09 ± 0.15 x10-7 m/s for HaCaT+Fibro, 1.09 ± 0.23 x10-7 m/s for Fibro and 1.29 ± 0.24 x10-7 m/s for HaCaT. There is no significant difference between the setups but a trend can be seen. The gels with fibroblasts seem to have a lower permeation property. In comparison to agarose gel the permeation coefficient in cell-collagen model is ten times lower (data not shown). 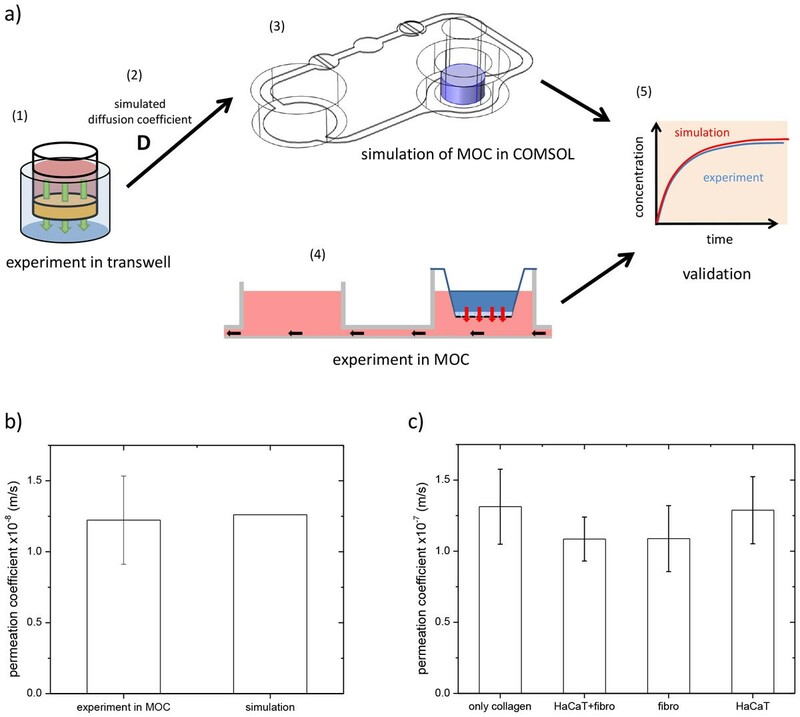 A method for the simulation of diffusion processes in a MOC with permeation experiment was established. First validations show a good fitting of the simulation. Further validation experiments with different substances should be done to determine the range of application of the simulation. A reproducible method in transwell systems was established. Further permeation experiments and simulations will be carried out with skin models.